Let's say you're an ant and you've just found a juicy treat; but it's too big for you to manage alone, so you retrace your steps to your nest and invite your sisters to come and help you. But the route you took to the treat involved threading your way through several ant-sized tight spots. The food won't fit through there, so even with your nest-mates to help you, you still won't get it home. So what do you do? Ofer - We were watching ants carrying large things together. So when the ants need food items that they can't carry alone, they can just team up – 10, 20, 30 – even more ants, and just haul it to the nests together. We’re looking at this phenomenon which is very interesting because it gives you the connection between a single ant and the group. You're seeing single ants pulling whatever and the group, doing what it does, transporting the item. Chris - If you watch what ants do individually, is it the same thing when they're working alone when they're carrying something small that a single ant can manage as when a big group of them do it or the different behaviours that go with those two different scenarios? Ofer - Yeah. So there is a slightly different behaviour. When you have a big object, the first ant to find it, she will trace to the nest and she will recruit other ants and then these ants will come back with her to the item, and they can carry it together. Chris - How do they find their way back to the nest? Do they follow a chemical trail laid down by the ants that first made that journey back and forth? Ofer - Exactly. So, when we looked at this first ant, we saw like a very fast stop and go motion. She runs and stops, runs and stops, runs and stops, and actually, when we looked at this from the side, we saw that each time she stops, she puts down her gaster, touches it to the surface, and that’s when she lays a small scent mark like laying pebbles in Hansel and Gretel. 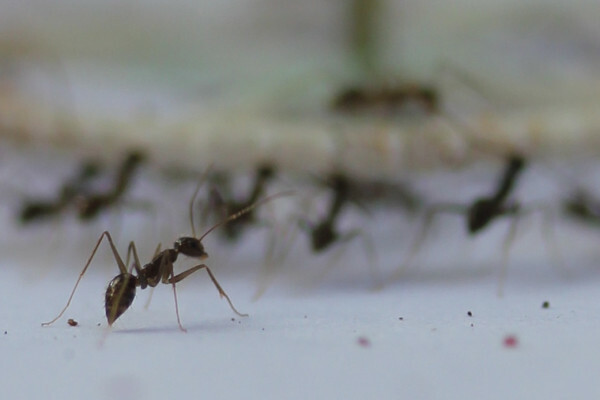 When the ants come out of the nest, they can follow these scent marks back to the food item. What we actually discovered now is that the ants also use scent marks also in the stage after they start to move the object when they're navigating the large object home and then they treat them in a very different way. Chris - Why do they behave differently? Why do they need new scent marks and how is their behaviour different on that occasion compared with the first occasion? Ofer - So actually, we filmed the ants and just from the stop and go motion of the ants, we can deduce where the scent marks were and we start to pinpoint each and every scent mark that the ants were laying during this movement. They're actually guiding. They're telling the object where to go next. And then we saw something that’s very interesting that these ants that were trying to guide the object, the food with their scent marks, were often making mistakes. There is some conflict between the different scales of organisation in the group. Here, it’s very simple. The ants can go through any narrow passage and maybe destroy this way to the nest. They will mark through there, but the object cannot pass. What we found when we looked at the sum of all these scent marks, actually, what works here is this new ant trail that is just made of very short markings by the ants. They just mark the next step to go, not the whole distance to the nest. This is one aspect of it. The second aspect of it is that the ants that carry don’t follow it religiously. If they would follow it religiously, they just get stuck in these narrow corridors. Chris - So, are you saying then that the ants which are carrying the load, they are contributing to the scent marks. Sometimes they get it right, sometimes they get it wrong, but equally, they don’t follow it religiously so they sometimes follow it wrong too, and this is going to introduce some sort of noise or error signal into the path they take and that’s in some way going to help them to get back with the big load to the nest more efficiently than if they were to just follow the original path laid down. Ofer - Right. They know how to navigate. They do this by giving very small opinions. They don’t give a huge opinion, “this is the whole path you should take to the nest. This is the next step you should take.” The carrying ants, they listen to it, but partially, they often ignore it. These two together, they tune the way that the group listens to the individuals. It tunes just so that they can pass through these complex environments. Chris - Obviously, you made the observations by watching in painstaking detail what these ants were doing, but you can speculate on that behaviour, but have you now taken the data and modelled it to say, “well, we think that’s what's going on so now, let’s do some simulations and see if this is genuinely what these ants have evolved to do. Ofer - Right. That’s what we did actually. We collaborated with another lab in France, their lab that studies distributed computing. Actually, the easiest way to explain the model that we came up with is by an analogy. Imagine that you're driving in some foreign country and it was just hit yesterday by a hurricane. What this hurricane did was turn to the road signs, but not all of the road signs. But not all of the road signs, like 95 per cent of the road signs are correct and you want to get from one city to your destination. What would you do? How would you follow these road signs? Most of them are correct. What you have to do, you have to carry a dice with you. Each time you reach the junction, you have to throw the dice. If you get one to five, you follow the road sign as it is. But if you get a 6, you just choose a random direction. The theory told us that this is optimal. This is the best you can do and you will reach your destination in almost the fastest time possible. This is completely analogous to what the ants were doing.